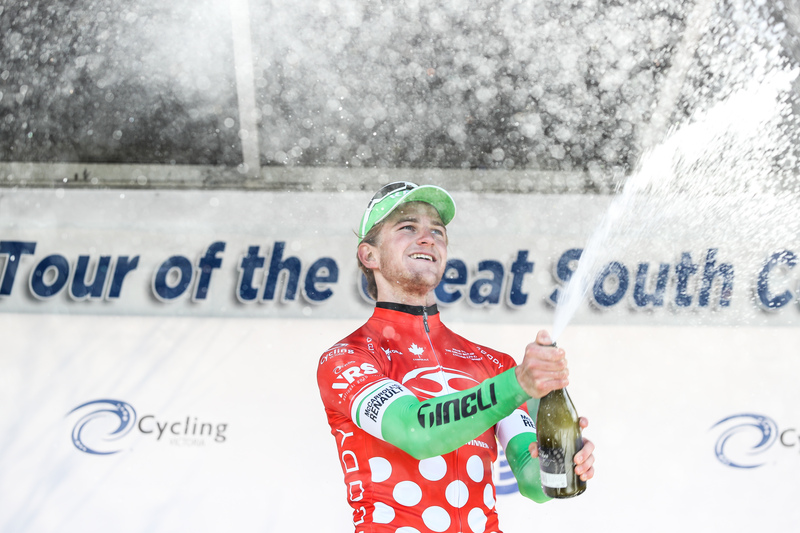 20 year old Nick White continued his purple patch of good form for the Green Team at the Tour of Great South Coast last week. Claiming his second King of the Mountains jersey in as many races, and finishing in 3rd place overall. The tour started well for the team with top 10 finishes on the first two stages to Russell Gill and Tom Bolton in Mount Gambier. Nick White then finished second to duel Commonwealth Games Gold medallist Sam Welsford (ACA-Ride Sunshine Coast) on stage 3 held in Port MacDonnell. Which promoted the Ballarat youngster into a podium position in the overall classification. He was reached as high as second place overall during the tour, but in the end was relegated to the 3rd place podium spot by German Raphael Freienstein (Inform-MAKE) who won the final stage criterium in Portland. White was dominant in the hill climbs of the tour. Finishing 1st in the King of the Mountains classification, White also finished ranked second in the Sprint classification. Oliver’s Racing finished in third place overall in the team classification, capping off a strong performance which will see the team remain in 4th place overall in the NRS team rankings. White currently sits in 3rd place in the NRS individual rankings.